Now you can dine and also give back to the community. RAISE NY is Kips Bay’s newest sports bar that partners different charities each month and donates 20% of their profits to charity. Whether its specialty drinks for the month or a seasonal dish, you can feel good that your spend is donated back. To date they have raised over 70K for various charities. Get your sports fix on with multiple large screen TVs throughout the bar featuring different games. 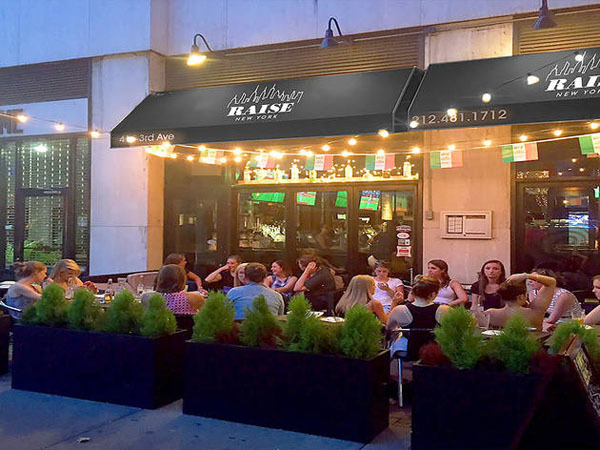 Or dine alfresco to enjoy the beautiful weather and bustling street action in their outdoor patio. Whether dining for brunch, lunch or dinner, Raise offers a solid selection of casual bar bites and elevated comfort fare. Enjoy a daily happy hour with a wide selection of wines, beers and specialty cocktails and $1 Bud Lights with the purchase of food for happy hour. Or partake in a boozy 2 hour bottomless brunch on the weekends for $35. A perfect venue for going out with friends without breaking the bank, Monday through Friday enjoy 3 sharing plates for $29 with half priced bottles of wine on Monday and Tuesday. The seasonally driven menu was created by Chef John Sierp who has appeared on Food Network’s Chopped, the Rachel Ray Show, Throwdown with Bobby Flay, and the Martha Stewart Show. Enjoy mouthwatering sharable elevated comfort fare such as Reuben dumplings made with corned beef, General Tso’s cauliflower, Mediterranean inspired flatbreads, wings with delectable sauces such as buffalo, teriyaki, honey sriracha, sweet chili, and spicy diablo, as well as loaded nachos. For those looking for lighter fare try the tacos filled with grilled shrimp, house braised pork belly, or Guiness braised beef, or opt for a Kale Caesar Salad. Pair with a potent cocktail and make a night of it.